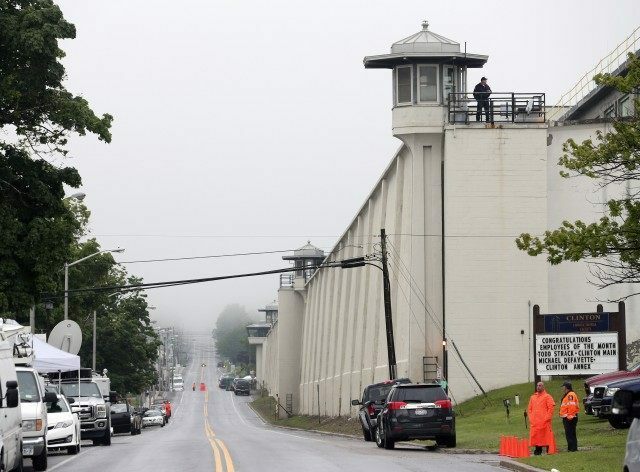 Palmer is the second employee of the Clinton Correctional Facility to be arrested. On June 12, Joyce Mitchell, a supervisor at the tailor shop where Matt and Sweat worked, was arrested on charges she aided Matt and Sweat in their escape by smuggling tools in to them. The two convicted killers escaped on the evening of June 5/morning of June 6, and have been on the run ever since. Breitbart News reported earlier today that Palmer’s attorney, Andrew Brockway, said that his client had unwittingly delivered the tools Mitchell had embedded hacksaw blades and drill bits into frozen hamburger on May 29. Mitchell had assured Palmer there was nothing wrong with the meat, but she apparently misled him. Clinton County District Attorney Andrew Wylie said that Mitchell had taken the frozen meat with the embedded tools through the front gate of the prison. Palmer, he said, broke the rules by passing the frozen meat, perhaps the country’s most famous “hamburger helper” over the past week, to the convicts while bypassing a metal detector.